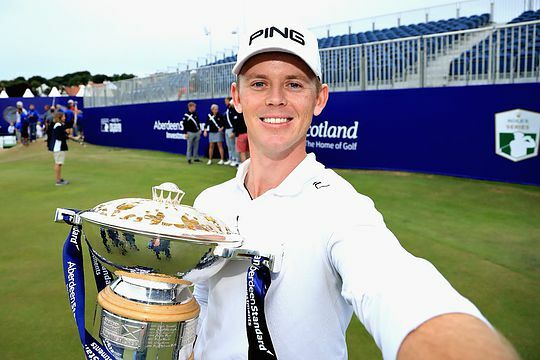 South African Brandon Stone fired a final round of 60 to win the Scottish Open by four shots over Englishman Eddie Pepperell on Sunday and in the process secured a spot at this week’s Open Championship at Carnoustie. Stone, 25, almost became the first player to shoot a round of 59 on a European Tour, missing a birdie putt on the 18th. There have been 28 previous rounds of 60 in a European Tour. Stone (Titleist Pro V1) carded eight birdies and an eagle in his first 16 holes at Gullane and needed to play the last two in one under par to break the magical 60 barrier. He began the final round three shots off the lead but went out in the front nine in 31 and picked up birdies on the 10th, 12th, 14th and 15th before holing a eagle putt from 12 metres on the par-five 16th to set up his victory and a chance of breaking 60. Yet the 10-under-par 60 was more than enough to secure his third victory on the European Tour and the first outside his home country. The 2015 Challenge Tour graduate last featured in the DP World Tour Championship in 2016 but his big win in Scotland means he has comfortably cemented his place alongside the top-60 players in the Race to Dubai. “It’s been a long 18-month journey, making a few changes, but the swing felt incredible today, the putting felt even better and the mental state was flawless,” said Stone. Pepperell certainly had his chances to secure his maiden win but a three-putt at the 17th to drop a shot before Stone holed an incredible putt on the par-5 16th to reach 20-under hurt the Englishman’s chances. Pepperell finished with a 64 to close at 16-under-par and although he was disappointed not to get the win, he will be playing at Carnoustie next week. The final Open place went to Jens Dantorp. The Swede had led through 54 holes and he closed with a 68 to finish tied third to earn his spot in his first Major championship. Scott Hend was the best of the Australians finishing at 12-under-par and in a share of 14th position. Cameron Smith fired a 7-under-par for a share of 42nd position, with Adam Bland even par for the tournament and in a share of 66th. Jason Scrivener, Andrew Dodt, Wade Ormsby, Sam Brazel, Jason Norris and Brett Rumford missed the weekend.